Playing in less than ideal circumstances because of Ioannis Bourousis’ absence, Keith Langford’s flu syntoms and the loss of Alessandro Gentile (right ankle: today more tests, but it looks like nothing too serious) after a few minutes, EA7 plays a great first half, with high defensive intensity, holds Efes Istanbul to 7 points in the second quarter but can’t complete the job. Defense loses a little of efficiency in the second half, in the third especially, three-point shooting is missing e there’s aldo an important difference in terms of fouls shots. Sasha Vuvacic, held at two points in the first half, scores 27 in the second including 17 in the third period. Olimpia stopped Jordan Farnar but couldn’t do the same to the Slovenian raised in Italy. 77-71 Anadolu Efes is the final score. 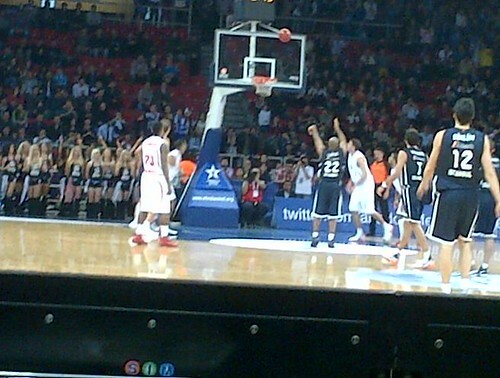 FIRST HALF – Efes starts on a high note, goes up 5-0 and 10-2 (the first field goal for EA7 is by Richie Hendrix). The eight-point lead shows again at 14-6 and 16-8 when Hendrix with a mid-range jumper and Gentile with a corner three stop Efes run. Just after that Gentile, falling down abnormally on a drive, turns his right ankle and has to leave the court. Efes scores 16 points in the first five minutes but just four in the second part of the first. Hairston, re-entering the game, scores five consecutive points and close the gap to two, 20-18 at the end of first. EA7 goes up after a Stipcevic three, then builds a three-point lead a cuple of times, with two Gianluca Basile’s field goals although Scariolo has to invent small line-ups, without Bourousis and Hendrix with two early fouls. EA7 keeps a lead in the middle of second. A Melli’s drive pushes EA7 up by four, 29-25, a Hairston field goal later Olimpia is up by sux and after two Erden’s misses from the line, Langford scores the 33-25 with 40 seconds left. In the last couple of possessions, Gonlum makes two from the line after a Chiotti’s block and Fotsis makes a three from the right corner at the buzzer. 36-27 EA7 at the intermission.